Real life has never been so animated. 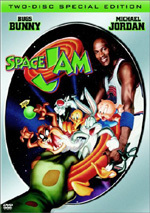 Set in a live-action world in which Warner Bros.' beloved assortment of irreverent animated entertainers interact with human characters for maximum comic effect, the story unfolds on the Studio backlot and careens all over the map in time-honored Looney Tunes style. Our celluloid heroes embark on a hilarious adventure that takes them from Hollywood to Las Vegas, Paris and the jungles of Africa in search of Fraser's character's missing father and the mythical "Blue Monkey Diamond". $9.317 million on 2903 screens. On paper, Looney Tunes: Back In Action sounded good. 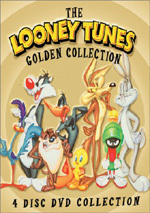 Audiences young and old love the Looney Tunes shorts, and Warner Bros. certainly promoted the heck out of the project. The studio also pushed out scads of Looney Tunes DVDs to raise public consciousness about the project; each and every one touted Action and even included free passes for the kiddies to see the new effort. It didn’t work. Despite good reviews and all this publicity, Action firmly tanked at the box office. It earned a poor $20 million, which barely brought back one-fourth of its $80 million budget. Daffy Duck (voiced by Joe Alaskey) once again bemoans his status as subordinate to Bugs Bunny (Alaskey). When they decide to make a new movie with those characters, Daffy threatens to bolt unless they choose him over Bugs. This doesn’t succeed, so they give the pathetic Duck the boot. In the meantime, we meet studio security guard DJ (Brendan Fraser). He wants to become a stuntman but he fails. His dad is Damian Drake (Timothy Dalton), an actor known for his work as a suave superspy, but he refuses to indulge in nepotism to do better. Studio VP Kate Houghton (Jenna Elfman) asks him to eject Daffy, but the Duck gives DJ the slip. DJ eventually tracks nabs Daffy, but their chase wreaks havoc on the Warner lot. Despite his family connection, DJ gets the boot. While Bugs meets with Kate, she learns that despite her attempts to convince him otherwise, the Bunny won’t work without Daffy. Soon we see that Daffy stowed away with DJ and we learn a little more about the latter’s home life. DJ gets a secret transmission from his dad that implores him to come to Las Vegas for a special case, as it turns out he really is a spy. He needs to find Dusty Tails (Heather Locklear) and help with a diamond called the Blue Monkey. DJ heads out, and once again, Daffy stows away with him. As they rush to Vegas, the studio attempts to deal with life after Daffy, which doesn’t work well. Kate gets fired, but she can reclaim her job if she brings back Daffy. Bugs calls Daffy on his cell phone, but the Duck refuses to return, as he’d rather go along to find the Blue Monkey. The plot thickens when we discover that the evil Acme Corporation captured Damian. The Chairman (Steve Martin) orders his minions to stop the spy’s son. He also demands that they render Daffy “extra crispy”. Kate and Bugs also head toward Vegas to get back the Duck and DJ. The rest of the movie follows these trails. We see all sorts of wacky shenanigans as DJ attempts to retrieve the diamond and save his dad. Along the way, he starts to develop into a secret agent himself. Action falls into the “throw everything at the wall and see what sticks” camp. My, does this movie move at a frantic pace! One might claim that it does so to emulate the pacing of an animated short, and one might correctly interpret the motivations of director Joe Dante. However, Action seems almost desperately frenetic, and it actually appears to proceed at a faster pace than the average cartoon. Given that the movie lasts roughly 13 times as long as the standard short, that becomes a problem. Actually, the film often feels like a bunch of cartoons connected loosely by the generic plot. We leap briskly from episode to episode and the audience never gets much of a chance to take a breather. This flick seems likely to wear down many viewers. Because Action throws out so many gags, inevitably some will stick. Indeed, the film offers a smattering of decent laughs. However, its average seems low. Too many of the jokes fall flat or seem excessively self-conscious. It gives us pointless movie references that don’t fit with the movie as well as far too many self-referential bits. Action likes to go for a form of ironic detachment, such as when the characters discuss product placement as they visit a Wal-Mart. Everyone here knows they’re in a movie, and they love to remind us that they’re aware of this. Frankly, that factor and all of the unrelated pop culture references get tiresome after a while. Most of them lack much cleverness and feel like inside jokes just for the sake of inside jokes. It also provides incessant cameos, and the whole “wink-wink, nudge-nudge” tone fails to work. We find a very Roger Rabbit vibe in Action, but the movie doesn’t work nearly as well. Rabbit featured better-developed characters and a more tangible plot that went somewhere. It also contained a slew of cultural references, but it didn’t beat the audience over the head with them as we find here. Action even depicts a world in which toons and humans co-exist in real life, just like Rabbit. This creates the occasional cute moment – a scene in which Shaggy and Scooby-Doo harass Matthew Lillard seems moderately funny – but in general, the premise has little life. Ultimately, Back in Action doesn’t seem like a bad flick, but it tries too hard to win over the audience. This manic sense of energy gives it some life, and it features enough jokes that some of them connect. However, it also exhausts the viewer before long, and appears likely to leave more folks with headaches than with smiles. Footnote: stick around through the finish of the end credits for a little concluding piece. 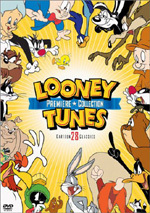 Looney Tunes: Back In Action appears in an aspect ratio of approximately 2.35:1 on this single-sided, double-layered DVD; the image has been enhanced for 16X9 televisions. Overall, the picture looked excellent. Sharpness seemed immaculate. The movie suffered from virtually no signs of softness, as it consistently appeared crisp and detailed. Even the widest shots still looked distinct and well rendered. I saw no issues connected to jagged edges or moiré effects, and only a smidgen of light edge enhancement ever appeared. As for print flaws, the movie displayed none. It remained clean and smooth at all times. A cartoon fantasy like Action merited a broad palette, and the DVD replicated these tones well. The colors looked quite bright and dynamic. From start to finish, the movie exhibited vivid and lively tones that seemed full and tight. Black levels were deep and rich, while low-light shots looked well developed and concise. Only the slight edge enhancement marred this otherwise terrific transfer. Despite the cartoon setting and all the mayhem inherent in it, the Dolby Digital 5.1 soundtrack of Looney Tunes: Back In Action seemed somewhat subdued. Still, it fared generally well nonetheless. The forward spectrum dominated and showed nice stereo imaging as well as good movement of different elements. Characters and effects zipped around the front smoothly and accurately. As for the surrounds, they occasionally displayed some unique audio; for example, Daffy might high tail it around the rear speakers, and a helicopter sequence made better use of those channels. However, the surrounds mostly stuck with general reinforcement of the front and didn’t make as much use of the possibilities as I’d expect. Audio quality seemed generally positive. Speech came across as natural and distinctive. I noticed no issues connected to intelligibility or edginess. Music appeared clean and distinctive, and the score was appropriately dynamic. Effects seemed slightly too bright at times, though they mostly were clear and accurate, and they lacked distortion. Bass response occasionally became quite loud and boomy. The low-end was largely solid, but it seemed overcranked at times. Overall, the audio of Action was fairly satisfying, but it lacked the ambition I’d like from this sort of flick. As we check out the extras, we start with the eight-minute and 40-second Behind the Tunes featurette. Hosted by Bugs and Daffy, they show us around the set. We check out some movie snippets, behind the scenes footage, and sound bites from director Joe Dante, actor\ Brendan Fraser, production designer Bill Brzeski, transportation coordinator Randy White, and animation director Eric Goldberg. We learn a little about the film’s sets, props, cars, and animation. All of this remains exceedingly rudimentary and we don’t really get much information from this promotional piece, but it seems fun enough to be worth a look. For a quick look at the special effects, we head to Bang, Crash, Boom! Also hosted by Bugs and Daffy, this seven-minute and 20-second program includes comments from puppeteer Bruce Lanoil and visual effects supervisor Chris Watts. The piece mostly tells us how they combined live-action with animation, though we also learn about the water tower collapse and a few other effects sequences. Despite the featurette’s brevity, it seems quite informative, and it works especially well due to the preponderance of behind the scenes footage. We check out the different animation sequences during various stages, which makes this a very fun piece. Bugs and Daffy again host the next program, the 10-minute and 35-second Looney Tunes Out of Action: Best Scenes You’ve Never Seen. In this, they lead us through an alternate opening, various pre-romantic clips with Kate and DJ, extra Area 52 bits, more material from the Eiffel Tower, wackier moments with Kate, a little more from the Acme boardroom, a different ending, and some random Daffy snippets. About half of them are true deleted scenes, while the others more accurately come across as small trims. None of them seem all that worthwhile, though Elfman shows up in a primitive bikini during the alternate ending and looks darned good. In addition to the film’s theatrical trailer, we get a new Looney Tunes short entitled Whizzard of Ow. This seven-minute and five-second cartoon stars Wile E. Coyote and the Road Runner. I never cared much for the Road Runner series, and this mediocre short didn’t change my mind. Happy footnote: unlike the vast majority of Warner Bros. DVDs, Back in Action includes subtitles for its video extras. We get English, Spanish and French text for all those components. Yay! Lastly, DVD-ROM users will find a few components. The area promises a link to “even more deleted scenes” as well as other things, I guess. Unfortunately, my computer kept getting error messages when I ran it, so I can’t comment directly on the DVD-ROM materials. 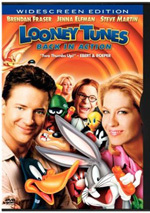 Looney Tunes: Back in Action aspires to be another Who Framed Roger Rabbit but it falls short of that classic’s level. Though it works hard for our love, the movie only occasionally delivers true entertainment. The DVD presents excellent picture quality with very good sound. While the package doesn’t include many extras, the ones we get seem fairly enjoyable. Families might get a kick out of Back in Action, but I can’t say the flick did much for me.